Sip, Savor, and Stargaze this Valentine’s Day. 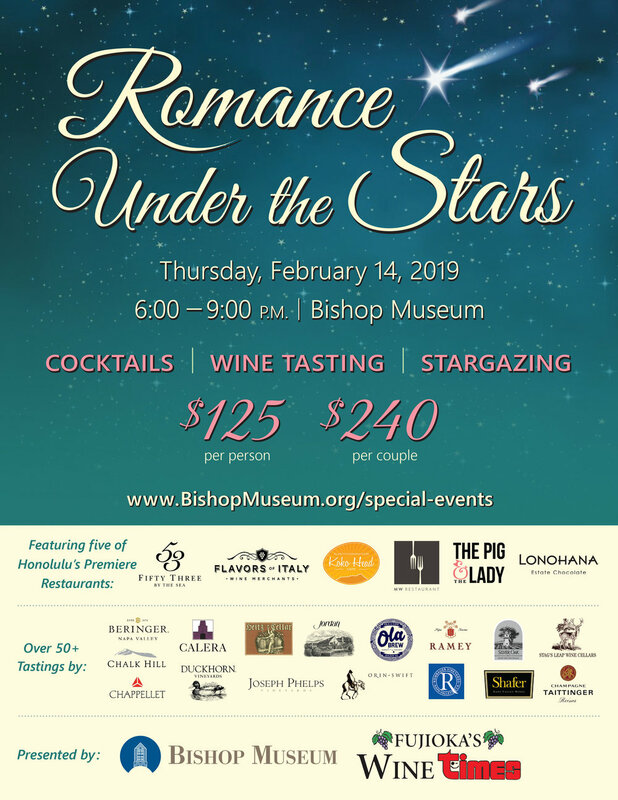 Stroll the night away with tastings from five of Honolulu’s best restaurants, featuring 53 by the Sea, Koko Head Café, MW Restaurant, The Pig & the Lady, and Flavors of Italy. Fujioka’s Wine Times will pour a wide selection of wines, top mixologists will handcraft specialty cocktails, and Ola Brew will serve up locally produced beers. Sample the extensive offerings of Lonohana Hawaiian Estate Chocolates all while listening to the compilation of Hawaiian soul, funk, and uplifting hits spun by Aloha Got Soul. Bishop Museum will open the J. Watumull Observatory and welcomes the Hawaiian Astronomical Society to allow everyone to stargaze under the night sky (weather permitting). All attendees will receive a complimentary Spiegelau wine glass to remember their evening. Come celebrate Valentine’s Day with your loved one, your friends, or even on your own! Bishop Museum Members receive 10% off ticket prices. Registration is required - Capacity is limited.